Kelly Design recently completed the label/packaging design for Hartford-based tortilla chip manufacturer Severance Foods. Severance Foods, Inc., located on Main Street in Hartford has been producing a wide variety of private label tortilla chips for more than 20 years. 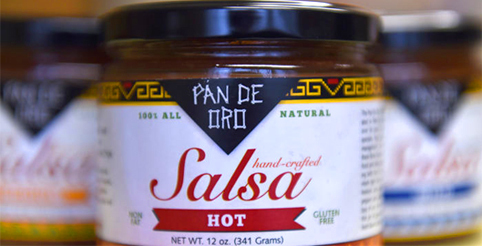 The company also produces it’s own brand of all natural tortilla chips under the name; Pan De Oro. This new product launch marks the company’s first venture into the all natural salsa market. Kelly Design has provided an array of services over the years for both the parent company; Severance Foods, Inc., as well as the house brand, Pan De Oro. Projects have including branding and identity design, product packaging, website development, marketing collateral, social media, online and traditional advertising. We wish Severance Foods all the best with this new product launch. What better way to enjoy a bag of all natural, organic and locally manufactured Pan De Oro Tortilla Chips than pairing them with a jar of delicious pineapple salsa!